July was a very very hot Month this summer. Records were broken in Lapland as the hottest July of the history continued day after day. Water temperature went up and water level kept going down. At the hardest part temperature was 23 degrees in the surface of the river. Air temperatures dropped finally on the last Weekend and during night time temps have been even near 0 degrees. That has cool down the water temperatures between 16-17 degrees at the moment. Water level has remain low, so you need to pick fishing pools according to it. End of July wasn’t easy with fishing because of the heat, but there were some nice numbers of salmon running during that time. Night and early morning fishing were sort of the only time and way to find at least some fish on line. But there were few nights when the temps were colder and those moments offered pretty good action with nice silver torpedos. Fly fishing from the boat. Now August has arrived and grilse are running. Last Weekend might have been “new kickstart” for the late season, when water cooled down and fish started bite properly. Caughten fish have been still mainly grilse, but few salmon size fish have been already caught this week. 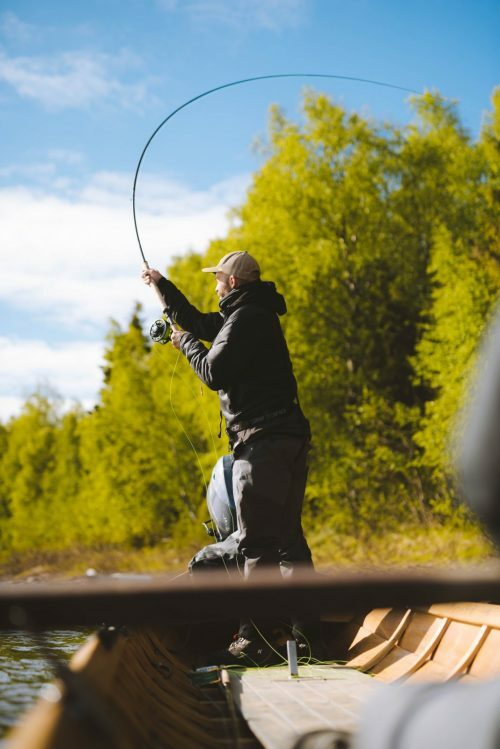 On last Weekend there were held annual salmon fishing contest at river Tornio called Salmon king competition. During two fishing days there were impressive 28 salmon caught and the winning fish weighted 9,6 kilos. 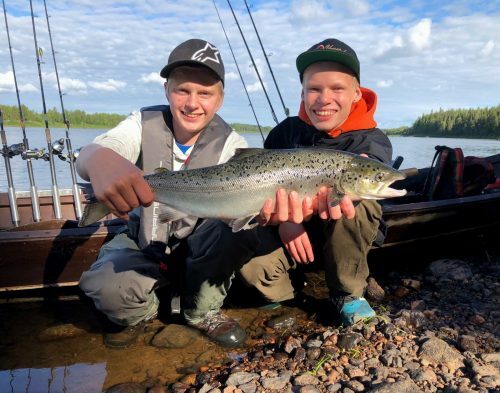 From our crew Saku & Valtteri and Samuli managed to caught fish, but with those grilse guys couldn’t jump at the podium this year. Young guns Saku and Valtteri delivering at the big moment in the contest! This week’s fishing has began well. We’ve already caught 8 salmon until Wednesday and lost few big ones. With fly fishing small hook flies and tubes such as the Banana fly, Red Samurai and other small black red flies have been effective. Floating line and fast presentation are keys to success right now. In boat fishing wobblers are starting work again, but same flies have been also still delivering. Water level is low, so you need to pick up places where you can find deeper holding places for fish. Black and red, all black, copper, black and orange and in sunlight red and gold have been good colours. Tight lines for all salmon fishermen in August! Remember that big females are especially important for the rivers and you should release all the coloured fish for the future.